Our Ancients campaign continues with another turn complete, this time covering the period 280 BC to 271 BC. I’m pleased with the changes to the mechanics and the support a number of locals are providing. This turn for example we have had five people involved in the games with a bit of a lottery on which armies you end up commanding. Everyone seems to be enjoying the context of the games than any focus on world conquest. All the playing states are suffering a mix of success and setback which is adding to overall interest. Pyrrhus, who is currently King of Macedonian, is under particular pressure. Despite this after two desperate battles he still controls his Macedonian throne, just. Meanwhile while Rome and Carthage are locked in combat Seleucus was last seen campaigning somewhere in Bactria. If you are interested you can find a full summary here. Having arrived home after my European sojourn it was good to breakout my miniatures for a couple of evenings of gaming this week. As it worked out it was a bit of a Punic Wars theme. First up were a couple of DBA games against Jim early in the week, while I was still very much in another time zone. Jim’s Carthaginians are, like my own, from the excellent Corvus Belli range. Opting for a pachyderm heavy army these beasts required some focus by the Romans to neutralise them before they broke up the Roman lines. Due to some interesting Punic tactics in the second game the Roman tactics were not completely successful. 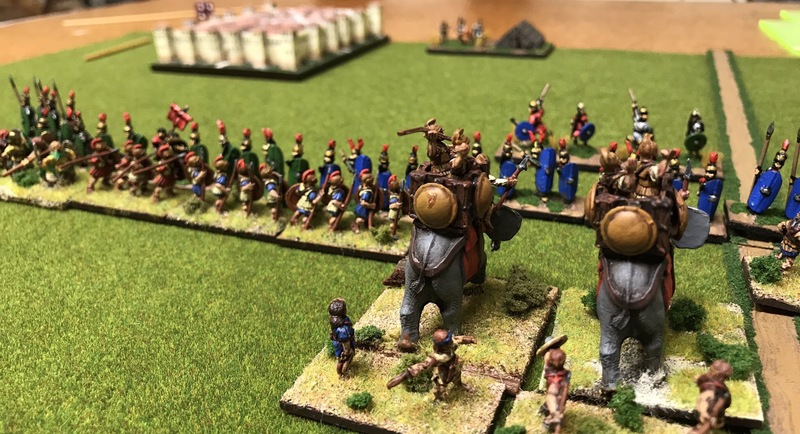 Above, Carthaginian light infantry, originally deployed in front of the elephants, nervously watch the elephants retire from the Roman infantry. 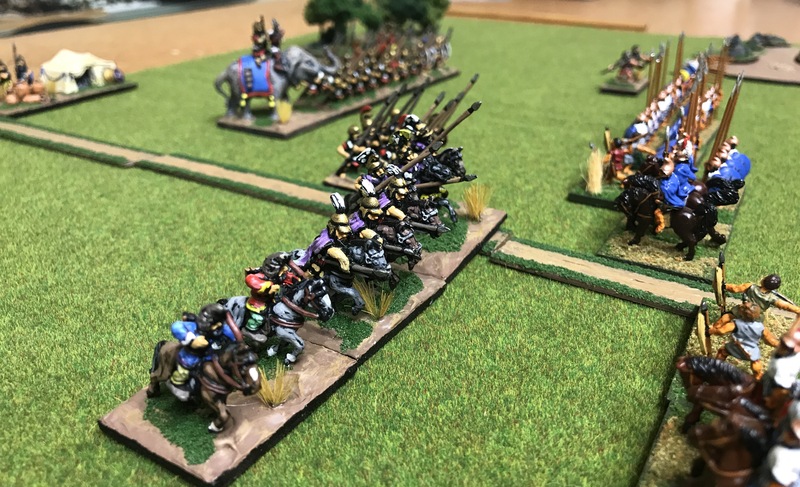 The elephants soon surged forward again disrupting but not breaking the Roman lines. Later in the week Colin made a long overdue appearance from the deep south and provided Andrew and I the opportunity for a couple of DBA games. Colin took command of my own Carthaginians in a two games where the battles formed part of our on-going Empire Campaign. Colin also opted for the pachyderm heavy Later Carthaginians, but supported them with auxiliary infantry (4Ax) rather than my own preference for some more aggressive Gauls. My own PIP dice, I commanded the Romans in the first game, were horrifically variable tending to the extremes causing consternation, joy and embarrassment in equal measure. By good control Colin slowly but surely defeated the Roman upstarts. 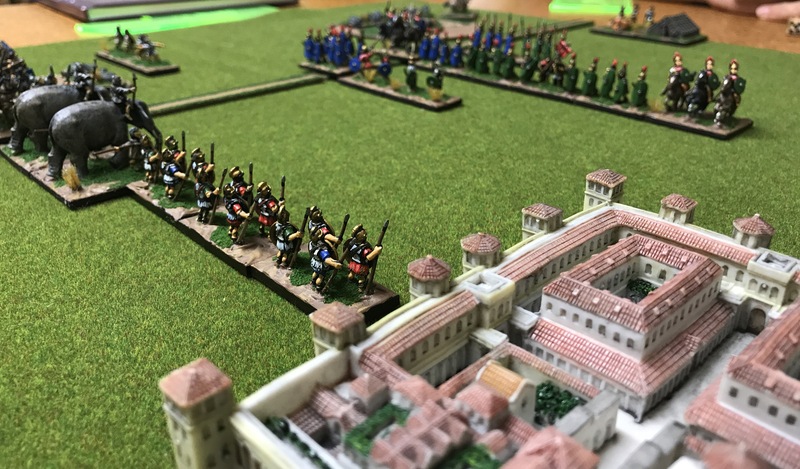 A new Consul was sought (Andrew) and in due course another Roman army was dispatched to lower Italy in an attempt to defeat the Punic invader. The Carthaginians selected a field of battle near a large city though their deployment was somewhat constrained by nearby hills. Now Punic command and control became hesitant and for some time the Carthaginian army refused to advance allowing the Romans to fully deploy. 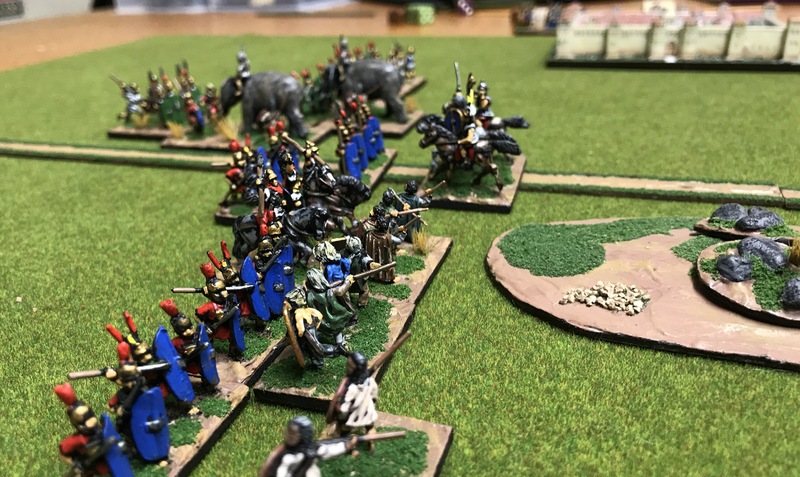 Good use of Roman light infantry slowly countered, if not destroyed the Punic elephants, while Roman and Italian heavy infantry slowly gained an advantage. 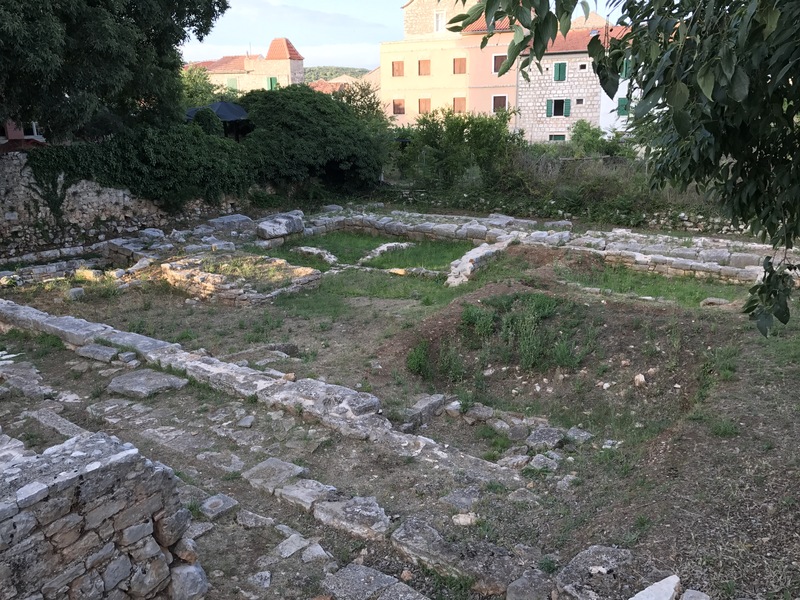 Recently I spent a few days at the Ancient city of Pharos, today known as Stari Grad, which is located on the modern island of Hvar, in the Adriatic. 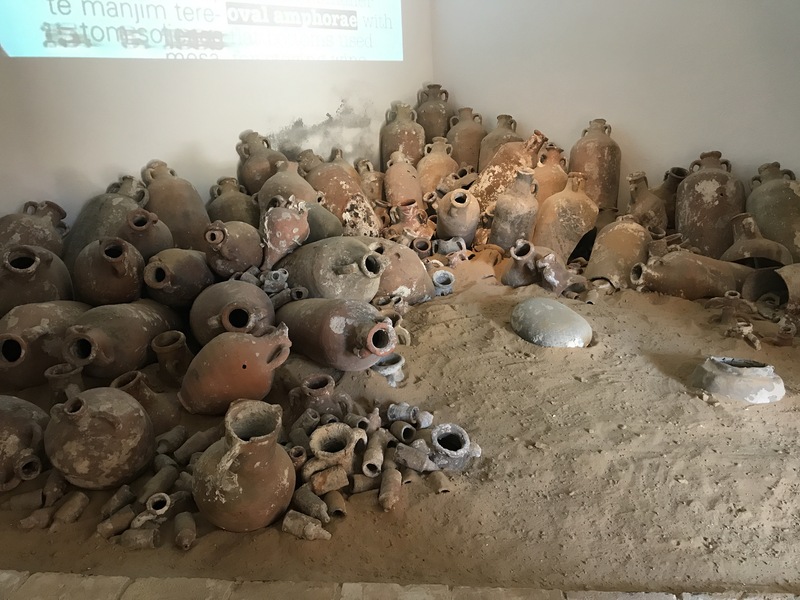 Pharos was founded by the Greeks in 385 BC and today a few interesting remains exist that provided, for me, an interesting couple of days while resting from my travels. East of the old part of Stari Grad, which is built on the Greek city of Pharos, is the Stari Glad Plain. 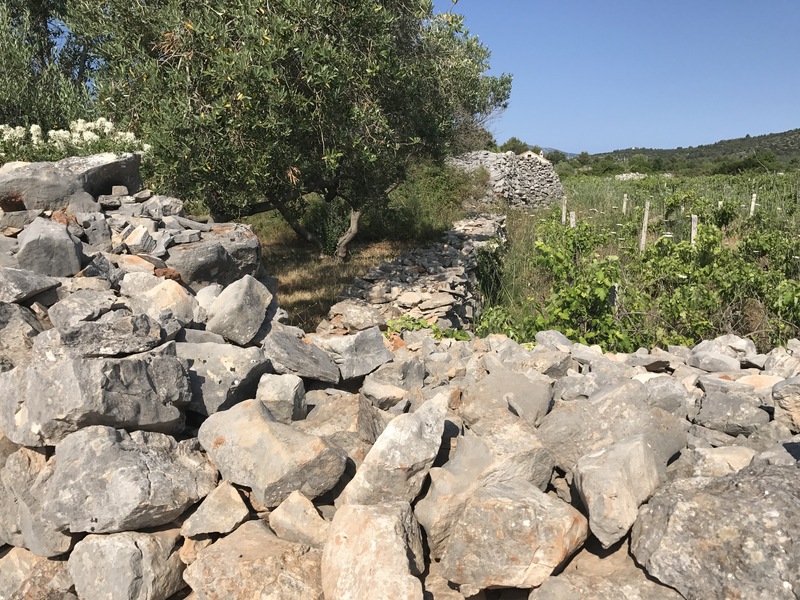 Here the land is divided into parcels of 180m by 900m bounded by dry stone walls. Today, the field system remains generally as it was when laid out by the Greeks and is the largest and most well preserved example in existence. 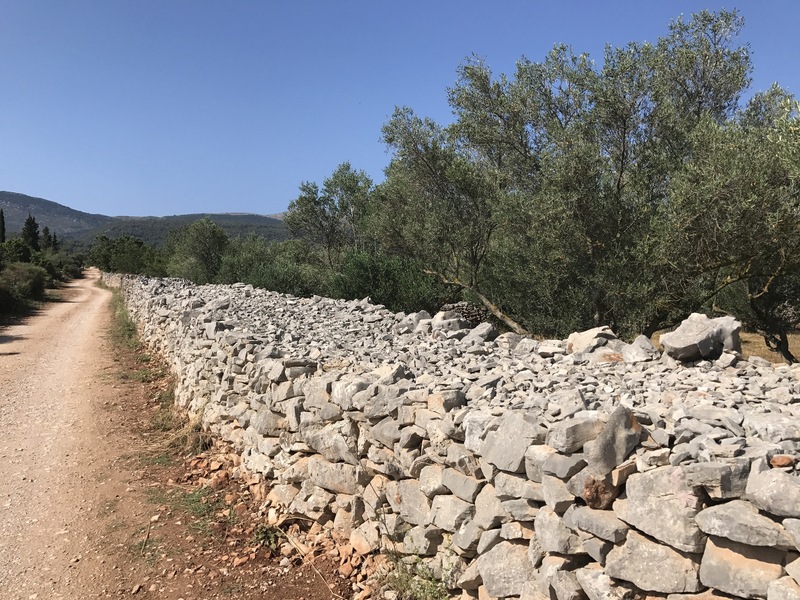 Some sections of the dry stone walls are, even today, 1.5m high and some upwards of a metre in width. Above and below, examples of the walls. In the one above you can see clearly the internal space filled with smaller stones. Apparently the field system included a rain water recovery system, though I found no evidence of this, but of course I wasn’t sure what to look for. During my visit I walked out to the remains of a Greek watch tower, part of a system to provide warning of attack. The information I received from the Stari Grad Information Office indicated an hour return. I took around two hours return. The plain is protected by UNESCO, and is one of seven such sites in Croatia. A plot marker, as well as tablets from the polis, can be found in Dominican Monastery museum. Unfortunately no photos were allowed. Stari Grad itself is a beautiful town with many old buildings clustered together. The old town is Medieval but is built on the Roman and Greek towns. 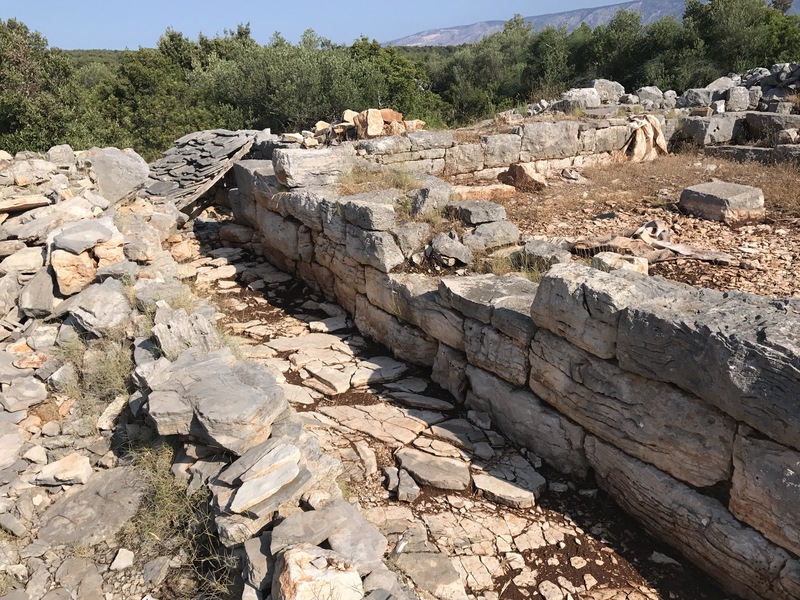 Recent archeological investigation has uncovered portions of a Greek road and sections of the old Greek walls. Below, the area around the church of Saint Ivan’s where the most recent archeological excavations have been completed. On the left part of the Greek road while in the distance a section of wall. Today, selected buildings within the town, including the lower levels of two imposing bell towers, are built using stones from the Greek city walls. The exhibits in the small Stari Grad Museum, separate from the Dominican Museum, were very interesting. One of my favourites was this terracotta fragment with mould above, and the seal below. Of course a good range of pottery was on display. Examples included, Greek, Southern Italian and less refined Illyrian. 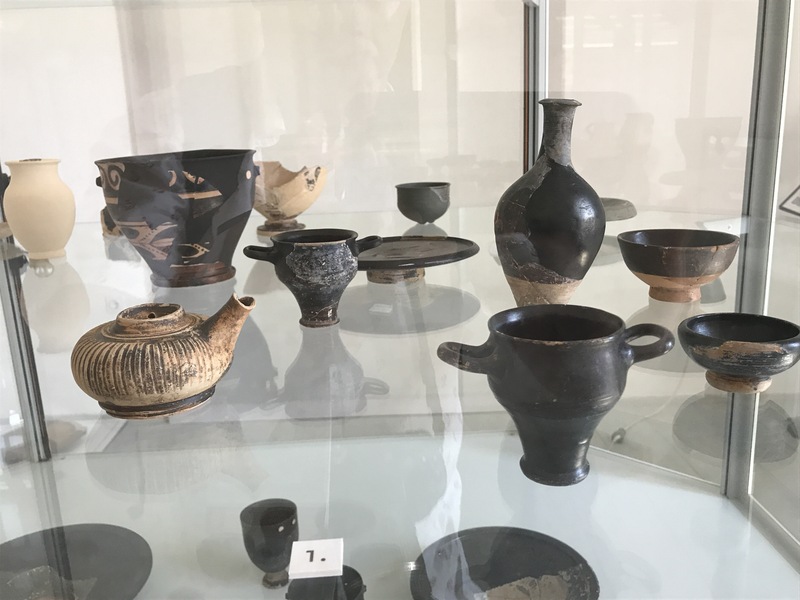 The museum also displays numerous amphorae from a wrecked 4th or 5th century Roman merchant ship discovered and displayed convincingly as they were found. A smaller display is in the Hvar citadel. Later, of course the Romans turned up. In 219 BC Demetrius of Pharos makes some bad decisions and Pharos comes under Roman rule following a battle around Phoros. 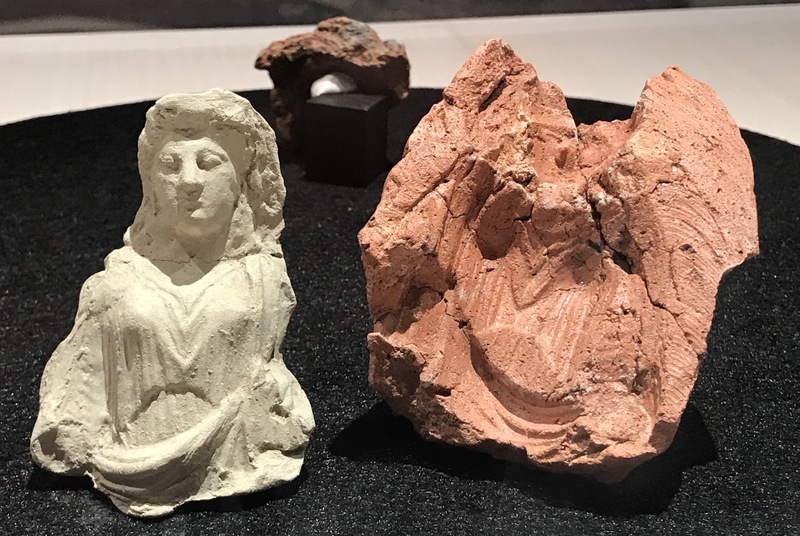 Again we have some excellent artefacts from this Roman period including pottery, coins and mosaics which have been discovered underneath the towns narrow streets. 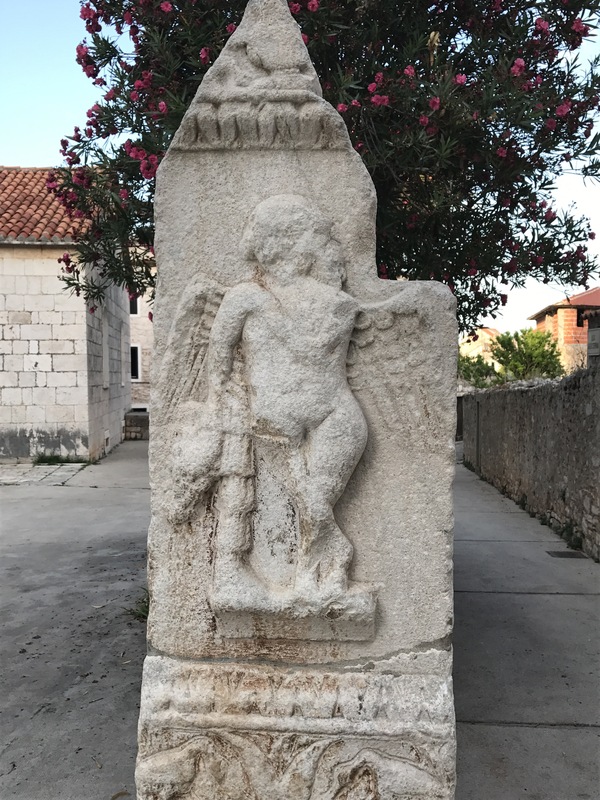 Today in the squares of Saint Stephens is Roman 2nd Century winged Eros is visible, though I managed to work past it twice! Within the bell tower, though I couldn’t see it, is an engraving of a Roman merchant vessel. Now, as to the name of this post. Well one of the paths I took across the Stari Grad Plain was called “The Path of Demetrius of Pharos”. It seemed fitting to use this as the name, converging Greek and Roman. If you are in the area you may find a day or two in Stari Grad of interest. 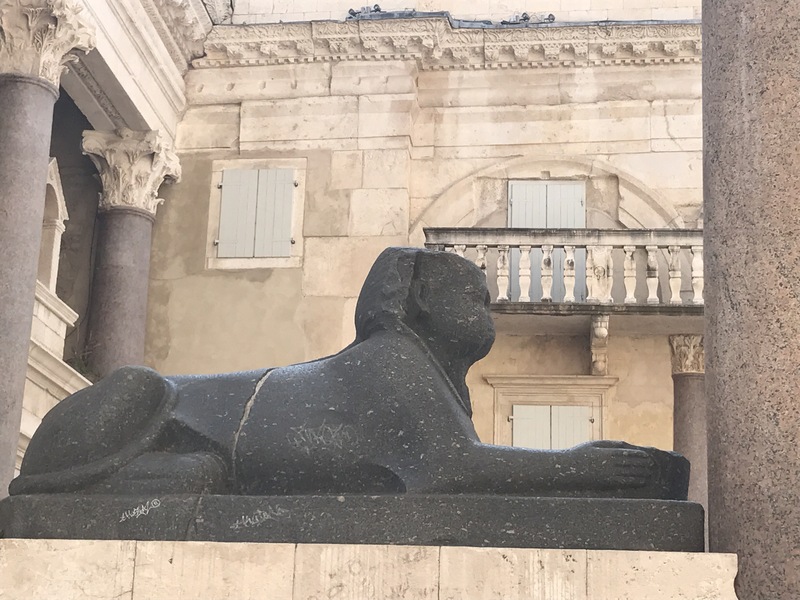 Yesterday I had the good fortune to spend the day in Split and in particular Diocletian’s Palace. I won’t go into the background history, suffice to say the palace was built between 295 AD and 305 AD by, and for, Diocletian. 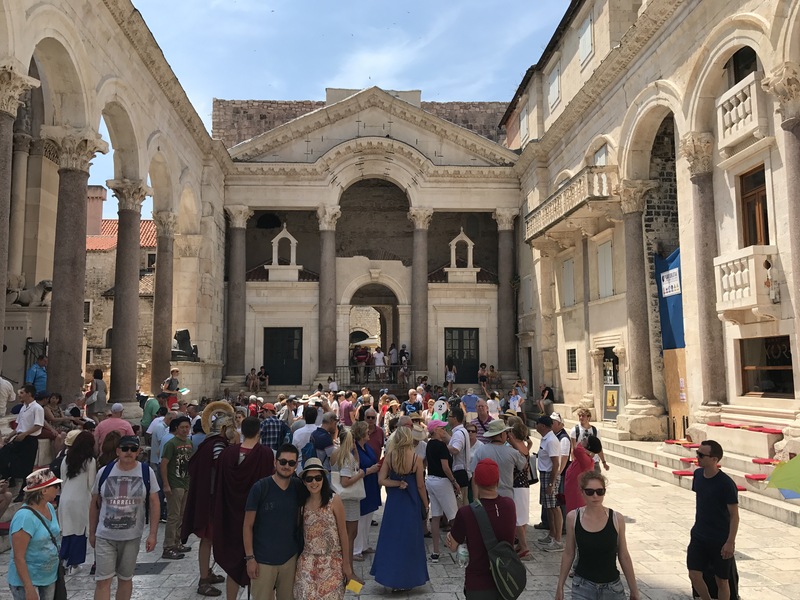 Today the palace is still very much in everyday use, by citizens of Split and by the tourists that visit but is protected as UNESCO World Heritage Site, one of seven protected sites in Croatia. Above, a the palace as it was originally built as drawn by archaeologist Ernest Hébrard in 1912. During the Medieval period a significant portion of the palace was replaced or absorbed by Medieval buildings. 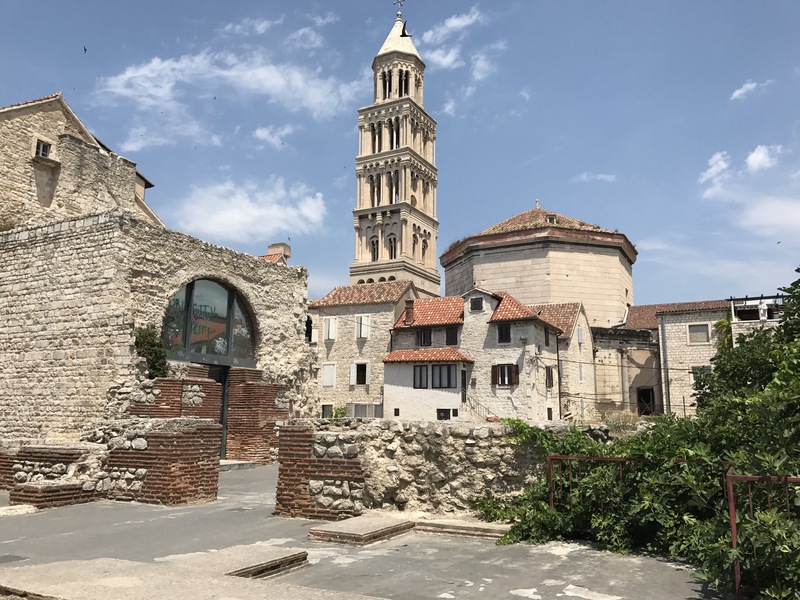 However, much remains from Diocletian’s period. With a careful observations, and the services of a guide, many interesting Roman period structures and architecture are visible, even to the untrained eye. Below, a portion of the Peristyle leading to Diocletian’s living areas. His mausoleum is on the left and the Temple of Jupiter to the right. The sandstone is from the island of Brac, which I’ve since passed, while the columns are of granite and imported from Egypt by Diocletian. You may have noticed a sphinx in the top left. There are three in the palace today and each are 3500 years old. Here is another view. The palace is rectangular approximately 160m by 190m and is divided into a garrison and administrative area, perhaps half the area. 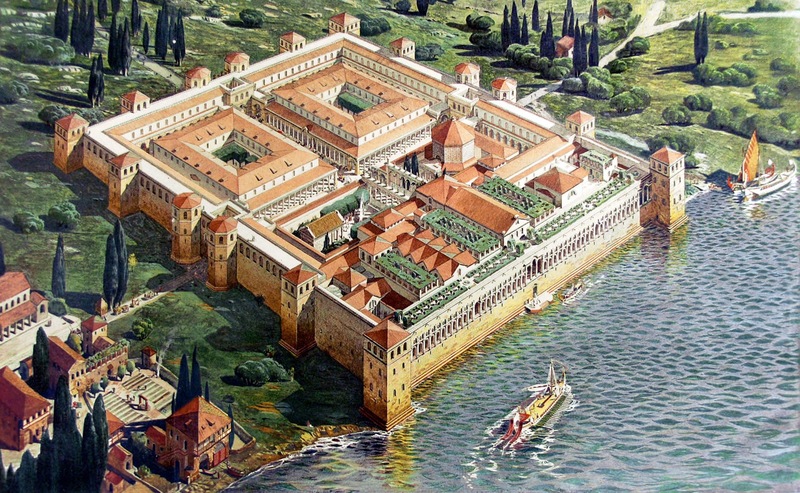 The remaining area is divided between a religious area and Diocletian’s living and sleeping areas, which face the sea. 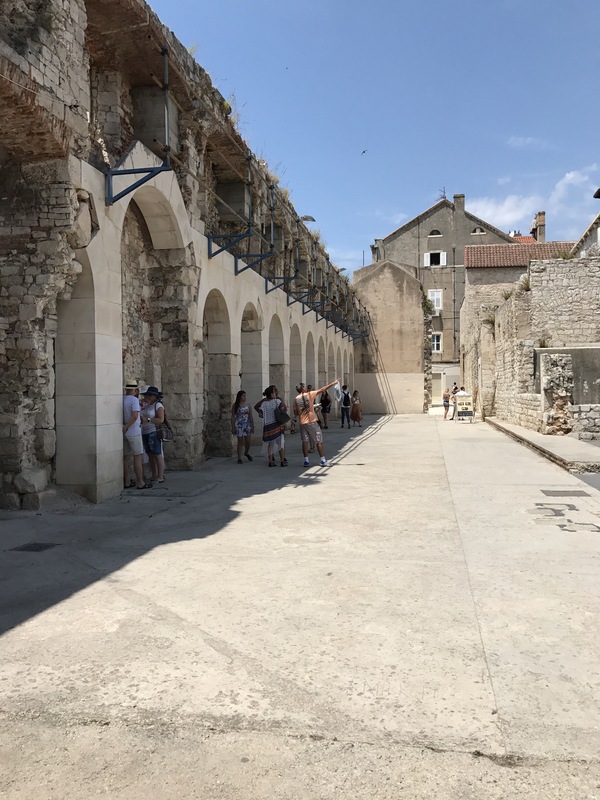 Above, is a section of Diocletian’s living area which originally provided excellent views of the Adriatic and today faces the port of Split. Below, a view across the remains of Diocletian’s dining area and in the distance the octagonal mausoleum of Diocletian. 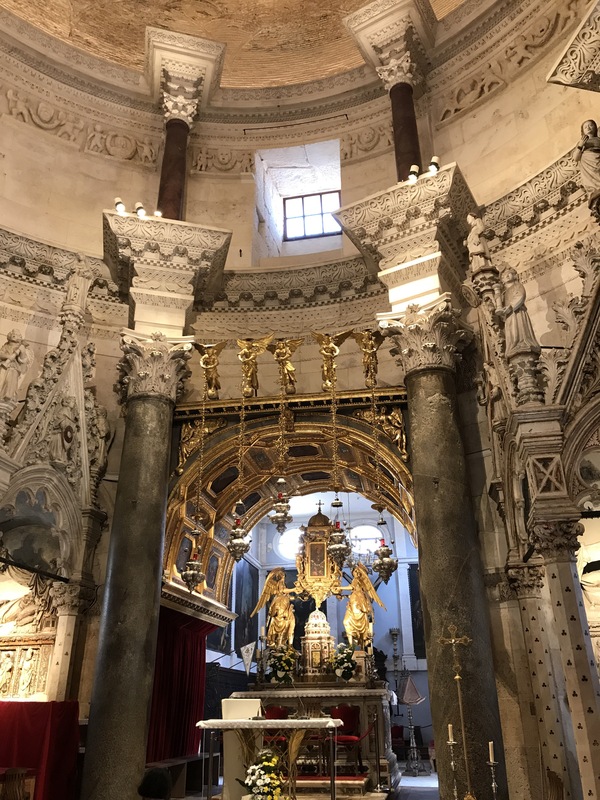 Diocletian’s mausoleum has been occupied by the Christians and as such was converted into a church. Despite this the mausoleum, inside and out, remains impressive. A section of the floor has been exposed to show the original floor 17cm below the current. In the detailing in the photo below that running around the top, broken by a window, is Roman and depicts, among other things, a hunting scene. Likewise, the Temple of Jupiter has found a new Christian role. Excavations under the palace since the 1950s, and more recently, have exposed the basement areas. These areas mimic the original structures above and have provided archaeologists excellent information on the structures. Some, such as this one are massive. There are several walking tours of the area palace and I recommend you taking one. They are extremely inexpensive. Mine was around 100 Croatian Kuna, which is around twenty or so New Zealand dollars. A ticket to the underground areas was from memory around half this but unfortunately had poor signage. Some tours include this area and I wish I had found one. Either way don’t miss it! Entry to the cathedral, mausoleum and Temple of Jupiter cost was 50 Croatian Kuna and is also excellent. There is a small museum in the palace area. Significant exhibits include Diocletian’s marble dining table, which you must see. In addition are many examples of edged weapons and firearms of Medieval, Venetian and Turkish origin. Useful maps here include the late baroque layout of the defences of Split from around 1660. Unfortunately, when I visited the English translations supposedly available through wifi access, were unreliable. 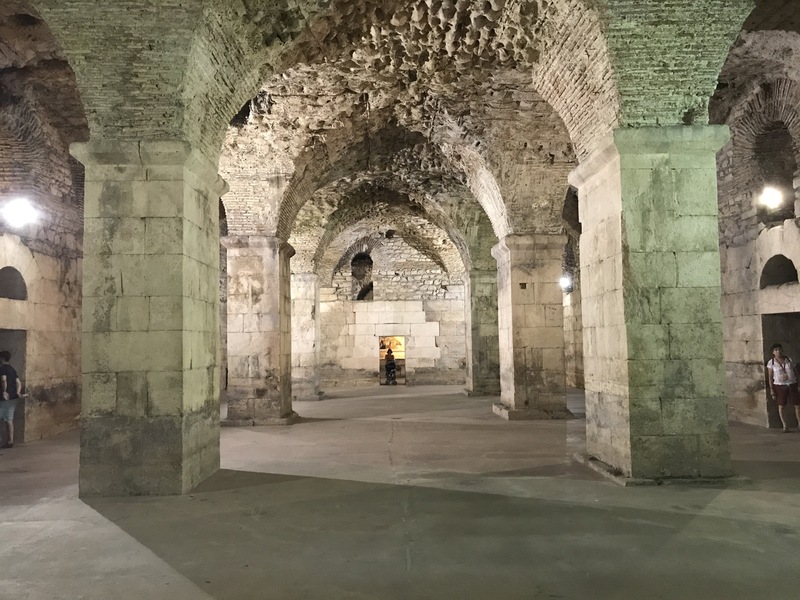 If you are in Croatia make sure Diocletian’s Palace is on your list. Campaigns are something I always have a inkling to run but past experience has made me nervous of too much complication. Regular readers of my blog may recall that early last year I posted my thoughts on the Empire boardgame, developed by Phil Sabin. After some tinkering with the basic rules I converted the mechanics to a system that would allow it to be used with DBA. Now, those who follow my Ancient & Medieval blog will have seen that we have recently completed the fourth campaign turn. Trying to simplify things further I recently moved away from dedicated players controlling states to a system where the decision process is automated. A basic decision tree is used to determine campaign offensives which is supplemented by a die roll where multiple options of equal weight exist. Games are now resolved by a group of volunteers subject to availability. The most recent series of six battles have now been resolved by a group of five players. I’m rather pleased how this has all worked out. The revised format seems to be providing a better balance between my time investment and the value created by linking a background to an individual tabletop game. Further, it allows me to play in a few games while others are able use different armies, rather than being restricted to that of their player state. Placing the campaign in context, and despite only four campaign turns, the system has generated around 24 battles all of which have been resolved on the table using DBA. Given there are many more campaign turns ahead it will be interesting to see the campaign history develop. 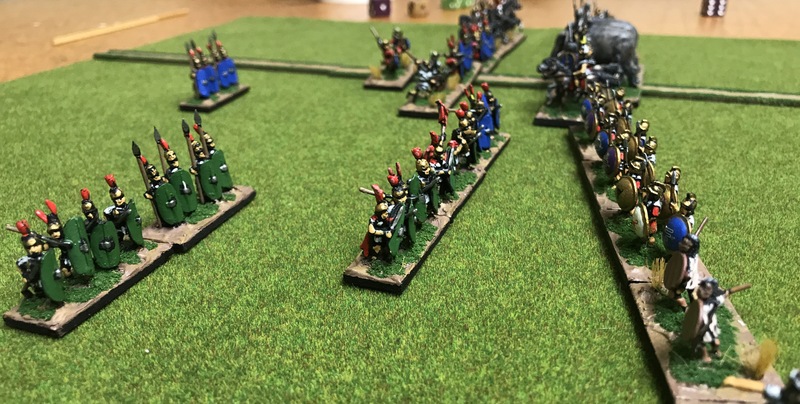 If you are interested in the most recent campaign turn, covering the period 290 BC to 281 BC, you can find it here. If you are interested in additional background, visit the Empire Campaign Page.